Hey there, everyone. I am thinking it is time I experiment with making a video and publishing it on YouTube. Have any of you done this yet, and if so, do you have any pointers? A weekend ago I was invited to participate in an event in New York City. I arrived into the city much earlier than I had planned, so I had a few hours to wander around and take some photos using my new Sony Cyber-shot digital camera (DSC-W330). Since I had the camera for less than 24 hours, I didn’t have a lot of time to experiment with the various settings, so this was my first trial. Click on the images to enlarge. Spring has sprung, and as such it is time to plant the grass. Over the winter, we had two blizzards that dropped over two feet of snow on the ground. In December, two feet of cold/dry snow fell, while in February we had two feet of heavy wet snow. This allowed the ground to absorb a lot of water, making the ground more friendly for me to work in. But first, let us examine the yard and see how it fared. As you can see from the pictures below, a lot of limbs and leaves came down during the winter. 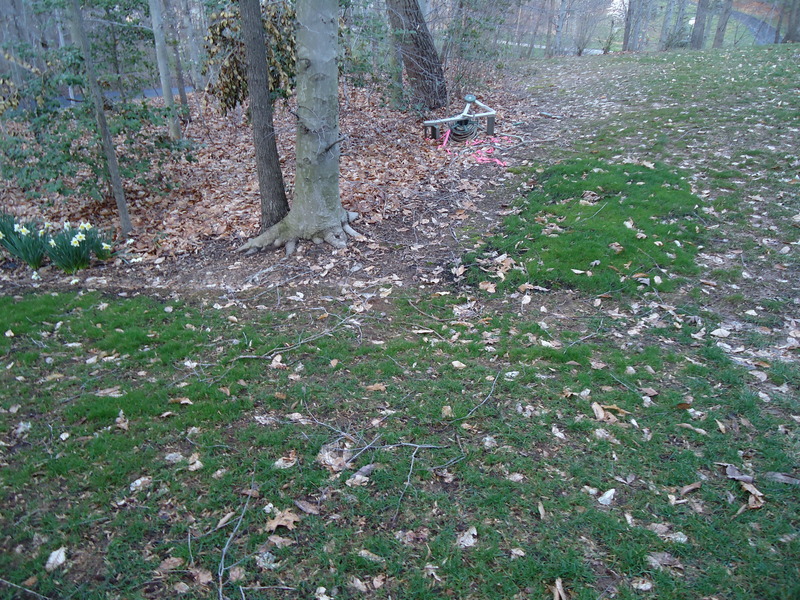 There are some nearly-bare sections of the yard where I had experimented the Smart Patch grass seed. Part of this is due to the erosion caused by the melting snow. Water runoff has been one of the largest issues I’ve had in this area (as noted before). Around the corner, the test patch of the Scotts grass seed as well as the area with the seeding soil has held up well. Definitely a sign that this is the way to proceed this spring. This is a sponsored guest post written by Michael Meier on behalf of winadream. Post powered by Sponzai. After the release of iPhone 3GS there are so many app available on the internet, some are paid one and some are free. Win now the fastest and most efficient iPhone 3GS 16GB! Voice recognition, Video, 3 megapixel camera and a digital compass are just some of the technical innovations. The famous features from the previous version such as the unique design with multi touch display, iPod, telephone and internet are still available. Personalise your iPhone and choose from over 10’000 apps. Your friends will be envious of the new iPhone 3GS which has achieved a cult status already! One of my favorite ways to relax is to log online and watch viral videos off of YouTube and Google. There are some great amature videos out there, with some looking like they were made by professional studios. It impresses me how creative people can be, and to be honest, I wish I had that skill. Every now-and-then I come across a link that says the video was removed because of copyright and license violations, and it made me start to wonder. How do you obtain video licensingfor a homemade video? Doing a quick search online, there are in fact services that help you license your material to protect your work (such as mDistribute). In fact, you can even earn money in the process. So what can I create a video on and publish? I could possibly film how I create some of the elements on my train table, or create an instructional video on how to do origami. But the first thing I need to do is to learn how to do video editing. I should work on that this year! “Bill and Teds Excellent Adventure” is on! It is such a most triumphant movie, that I love it when I catch it on tv. I remember the first time I saw it. We were in a movie theater, and the projector booth was having issues with the film. The audio kept cutting out, and video would skip at times. Got to love the old movie reels, let alone the early works of Keanu Reeves and Alex Winter . . . along with my personal favorite George Carlin. There are rumors that there will be a remake of this classic movie. Wyld Stallions will be replaced by the Atomic Gorillas, and many of the famous catchphrases will be replaced with new modern references. Such a shame, really. The movie cannot be improved upon, which the “Bogus Journey” proved. While it was a great sequel, it didn’t have the magic of the first. My hope is that the rumors of a remake do not pan out. In the mean time, be excellent to each other, and . . . PARTY ON, DUDES! I love this list just for the mere fact that I’ve either seen or heard of these alternate uses in practice. And when you consider how cheap these coffee filters are, you might just want to go ahead and experiment for yourselves. Seen this in the office. 2. Clean windows, mirrors, and chrome… Coffee filters are lint-free so they’ll leave windows sparkling..
I’ve heard about this before. 7. Recycle frying oil. After frying, strain oil through a sieve lined with a coffee filter..
I’ve been thinking about trying this when I repot one of my little trees. When you poor water into the pot currently, it runs right through, leaving a dirty trail behind. I don’t see why it wouldn’t work. It stops coffee grounds from entering the coffee pot after all. 11. Prevent a Popsicle from dripping. Poke one or two holes as needed in a coffee filter..
I’ve always used papertowels in the past, so I’ll have to try a filter next time. 22.. Use them to remove fingernail polish when out of cotton balls. 23.. Use them to sprout seeds.. Simply dampen the coffee filter, place seeds inside, fold it and place it into a plastic baggie until they sprout. If I try to start some flowers from seeds this year, I might give this a try (and post pictures). You are currently browsing the MODU's Musings blog archives for March, 2010.